Another 90 measles cases were reported last week, according to the CDC. There have been 555 cases this year. Measles cases are up 300 percent worldwide this year, according to the WHO. New York City Mayor Bill de Blasio speaks during a news conference declaring a public health emergency in parts of Brooklyn in response to a measles outbreak, requiring unvaccinated people living in the affected areas to get the vaccine or face fines, in the Orthodox Jewish community of the Williamsburg neighborhood, in Brooklyn, New York City, April 9, 2019. 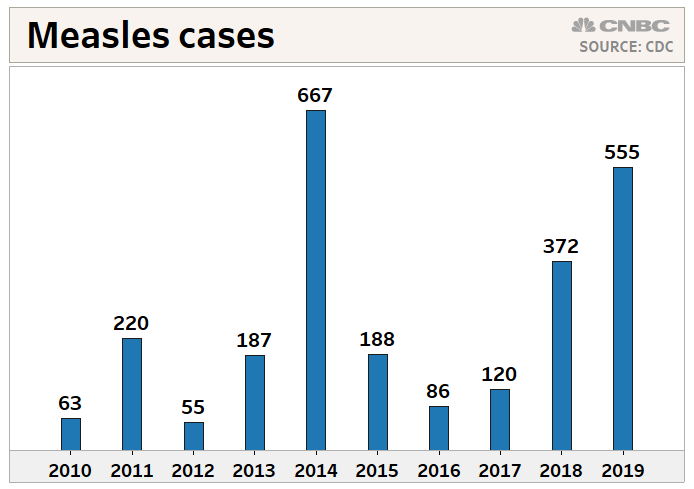 The CDC has confirmed 555 measles cases from Jan. 1 through April 11 — approaching the 667 cases diagnosed in 2014 — just four months into this year. Of the 90 new cases reported last week, 77 were in New York, the CDC said. Fifty cases were reported in New York City and 27 were reported in Rockland County. New York City Mayor Bill de Blasio last week declared measles a public health emergency and ordered mandatory vaccinations for people living in Brooklyn's Williamsburg neighborhood where the disease is spreading. Since January, the disease has been reported in 20 states. Outbreaks, defined as three or more cases, are ongoing in five areas: New York City, New York State's Rockland County, Washington, New Jersey, California's Santa Cruz County and California's Butte County.